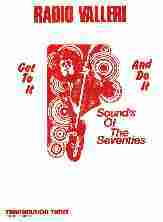 Anyone tuning across the 48 metre free radio shortwave band during the 1970's would probably remember hearing the song "Valleri" by The Monkees. It signified the sign-on and sign-off of Radio Valleri, one of the longest running stations of the decade. The station wasn't always on shortwave however. Radio Valleri was actually one of the early free radio stations to transmit to the Dublin area. It began broadcasting during the Summer of 1972 on a medium wave frequency of 1525kHz with 30 watts of power. The station started operating from a garden shed in North Dublin on a Sunday by two young radio enthusiasts, Derek Jones and Mike Anderson. Radio Valleri first transmitted on Sunday 23rd July 1972 between 12 mid-day and 1pm with a half hour from each of the founding members. Transmission times were extended as they were joined by Arno St Jude and Edward LeRoy and operated regular Sundays until late September of that year when they closed down due to transmitter problems. At this point, Arno St Jude left to be on Radio Melinda. The station's next broadcast was in 1973, but this time they had moved to shortwave. The operators had been persuaded by their engineer to try this band, and a suitable transmitter was built. The change to shortwave was a great success, with letters being received from listeners all across Europe. 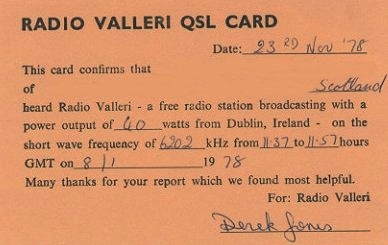 As Ireland did not have an Government operated International Service at this time (this had closed decades before), Radio Valleri became the 'Voice of Ireland' on shortwave. The frequency used during this period was initially 6317kHz, moving to 6260kHz and finally 6210kHz prior to the station closing in October 1974 after a year of Sunday transmissions. The station returned in Autumn 1975, and regular Sunday broadcasts were made until December, when heavy Post Office activity in Dublin caused a cessation of broadcasts until May 1976. Following the return in May 1976, Radio Valleri operated for several years on a number of frequencies starting on 6260kHz. In late 1976 there were reports in the Free Radio press of a new station called Premier Radio about to start from Dublin on 6260kHz. 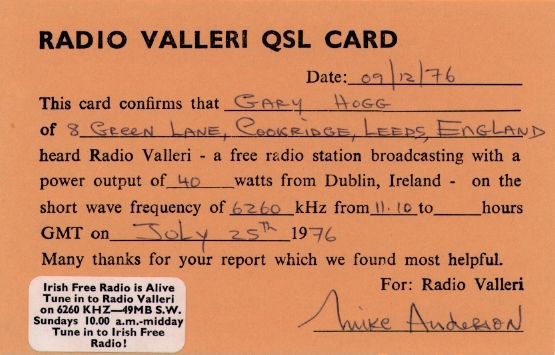 Although no signals from this new station were ever logged, Radio Valleri moved to 6202kHz in January 1977. (Note: 6260kHz was later used in 1979 by Radio Cill Dara International). In February 1977 the English magazine 'Free Radio Waves' featured a history of Radio Valleri in its 3rd issue. 6202kHz continued to be used for a time, but transmissions eventually ceased, possibly during mid-1979. Radio Valleri was next heard during the 1980's on 6400kHz, although the signal was never as strong as it had been during the 1970's. Of the station founders, only Derek Jones is still involved in radio, and could be heard on Radio Caroline Dublin on a Sunday morning until late 2000. He now has a show on the internet station WXTC. Mike Anderson is no longer involved, but the two still meet regularly for a drink or two. Arno St Jude, now known as Declan Meehan pursued radio as a full time job, and has worked on many successful stations since those early transmissions in 1972, (including ARD, Sunshine Radio, Radio Nova, and even RTE Radio 2) and currently has shows on the Irish national commercial station Today FM, and the local East Coast Radio in Bray. Most of Radio Valleri's broadcasts were live and as a result very few recordings of the station seem to have survived. Some of those which did are available on the Radio Valleri aircheck page. Even rarer are photos of the station. 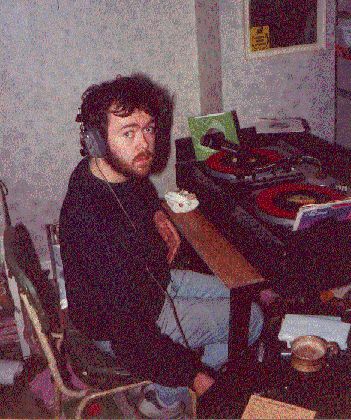 Here see Mike Anderson in action around 1982 when the station had moved from the garden shed to the luxury of Derek Jones's back bedroom. Mike can also be seen in a photo taken around the early 1980's when Capital Radio International operated from the same room! Posters, pennants and stickers were amongst the memorabilia sent out by the station during the 1970's. There were wo slightly different posters. One had no frequency or times stated, and was possibly from when the station was on medium wave. The second advertised 6202kHz and included the word 'International'. Click on any of the thumbnails above to view the full sized Radio Valleri poster or pennant. Two QSL's received from the station for two of their shortwave frequencies. The one above for 6260kHz was signed by Mike Anderson and the one below for the later channel of 6202kHz by Derek Jones.